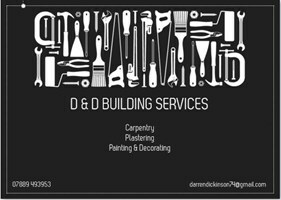 D & D Building Services - Carpenter, Painter/Decorator, Plasterer based in Carshalton, Surrey. D & D Building Services is a friendly family business with over 25 years experience in the building trade. We pride ourselves on our excellent standards and service. We find that we deal with a lot of repeat business and word of mouth recommendations which we feel speaks for itself. We offer an all in one service of carpentry, plastering and painting and decorating to a very high standard. We, of course, provide free no obligation estimates and consider ourselves competitively priced. We have full public liability insurance and can provide references.